Fame, fortune and whatever you’re having yourself. The word ‘famous’ comes from the Latin word ‘famosus’ meaning ‘much talked of/renowned’. The other day I went for a cycle with an old friend. ‘The writing is going very pleasantly.’ I replied. I did enter a few writing competitions some years ago but won only one of them. I also received an email from Dermot Healy (Who sadly passed away last July) about another piece I had entered. ‘Competitions are for race horses’ he wrote to me ‘ keep writing!’. Our art teacher was a nun and she would enter us into various competitions which we duly won. My father would be furious! We earned no congratulations from him for winning! In fact we didn’t really dare tell him and, as he was busy designing and water coloring and fishing, my mother would take us on the sly to wherever the prize giving reception was being held. We would walk up to receive our prize, the only children whose father was not present, and my mother would sit smiling serenely among the other parents as though a single mom. Being practical, we chose prizes like tennis rackets and transistor radios. Things we wished for but, being from a large family, never had priority on the shopping list. We didn’t like to remind my father that, by entering a competition as a final year architectural student back in the early 50’s, his own career as a ‘famous’ architect took off. But I know someone who was and if that wasn’t enough for me I recently met someone who is. Martin was famous by default! Of course his real name wasn’t Martin. I have just given him that name in order to preserve his identity. 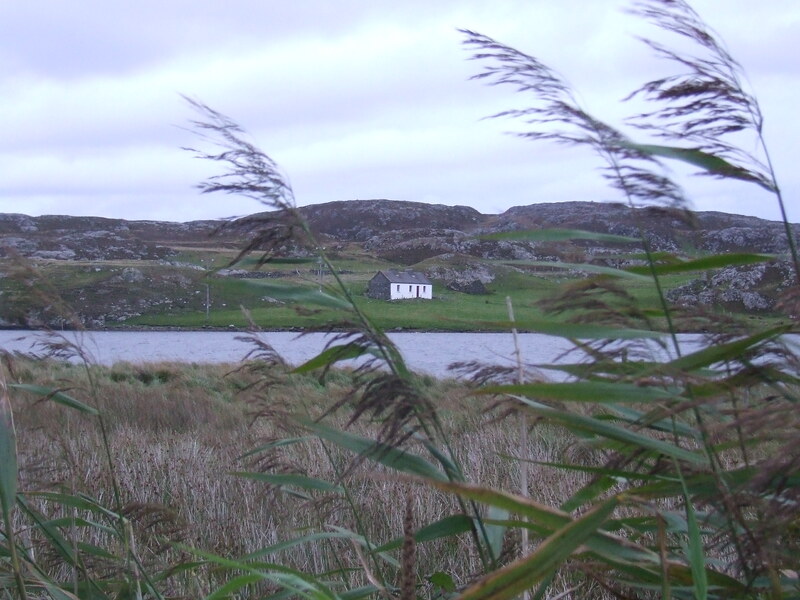 Well he lived in a small cottage down by the sea and the thought of fans lining along the boreen trying to catch a glimpse of him would not only have embarrassed him but would have been impractical. Already two cars (a rare occurrence) could not pass each other on his road. If they did happen to meet, then one would have to reverse back till they reached a gateway to pull in to. So you could imagine the bedlam it would cause if his fame had become so widespread that touring buses were involved in the equation. On that note if you ever find yourself in this situation and realize that you have always been the one to reverse , I suggest tossing a coin! I have seen this used successfully and dissipating many a fight. He held up a foot as proof. Sure enough his wellingtons had all the signs of being functional brake pads. The threads on the soles were worn away completely. There was also a slit in the back of the right one which I noticed as, adjusting his cap further back on his snowy white thick crop of hair, he would bid me farewell and turn to mount his bike. This manoeuvre he did with panache. Holding the long stick and gripping the handlebars he would place his left wellington (the one with the slit) on the left pedal, then with the right he would scoot a few paces and when he had picked up momentum he would lean forward over the handlebars and lift his right leg slowly. Then, as gracefully as the great Nureyev executing a complicated arabesque, his right leg would clear the saddle with barely an inch to spare and when his behind landed on the saddle, he would slowly start to crank the pedals and away he would go, the rattle of the mudguard growing softer as he headed down the road. At the bottom of the small hill he would turn and raise his hand and whistle for beauty(his dog) who, after giving one final sniff of my gate post, would trot after his master. I would watch the pair heading up over that small hill, where they would be silhouetted for an instant against the skyline before disappearing from view. Martin was my meditative cycling teacher. It was from him I learnt that when on a bike there was no need for speed. 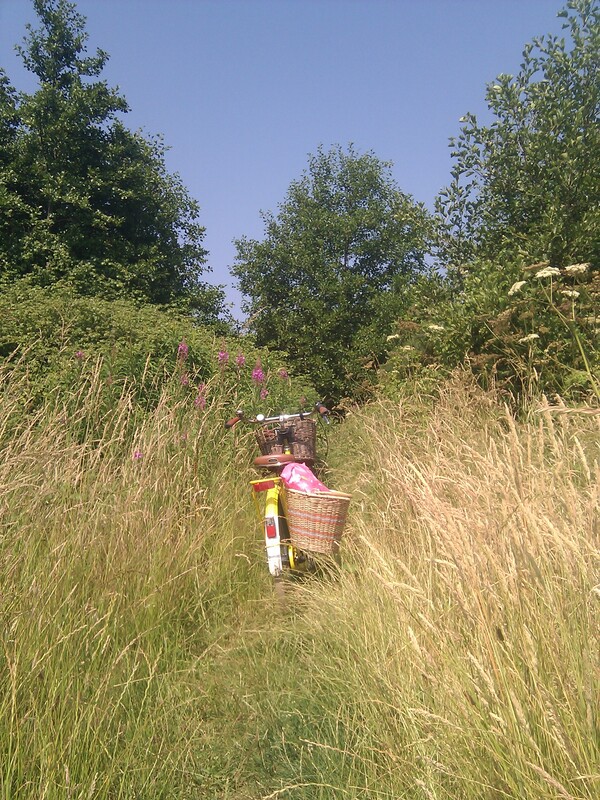 That cycling slowly regarding one’s surroundings was the epitome of contentment. He always had Beauty in tow, a cheerful hound with a tongue constantly lagging from its mouth and a coat matted with burr’s like that of a Rastafarian hairdo. Beauty would lope along beside Martin, stopping to raise its leg against various trees or stone walls along the way. I wondered if the dog had diabetes(seriously) (his diet would have been the slops of sugared tea soaked bread crusts, left over from martins breakfast or the rinds of rashers from his dinner), because that dog peed a lot. Martin lived with his brother. Tom was so stooped he seemed almost bent in two and appeared to spend his days wandering along the stony seaweed scattered shoreline collecting washed up pieces of timber. He wore a sack over his bent back and muttered to himself as he wandered along. Despite his difficult stature, he was extremely agile and moved with confidence and speed. Not an easy task on the slippy shoreline for even the most upright of men. Every now and then he would straighten slightly as the weight of the bag caused it to swing around under his belly, and with a shove he would re adjust it again to its proper place. As the bag grew heavier he had to carry out this adjustment more frequently. A job that might irritate another man, but not Tom. He never showed any impatience. Well at times as I would sit gazing out to sea from my favorite spot, he would come into my line of vision and that in itself was a wonder. With his ancient tweedy clothing of moss greens, browns and greys, he blended thoroughly into the background. An unintentional camouflage. It would take a well sighted person to spot him. He appeared to live in a world of his own and each time he picked a piece of driftwood, he would hold it up twisting it this way and that, giving it his undivided attention. I would see his mouth move and hear his soft murmurings as though talking to it. I liked to imagine he was really a famous artist gathering material for amazing sculptures and communing with each piece, mentally allocating it to its place in his latest creation. If Tom noticed me (and indeed his faded blue eyes rarely missed a thing) he would amble over for a chat. A vocal barrage as lilting as the small waves on the shore in front of us. Almost like a song or a chant. It was really just a very bad stammer and as he struggled, repeating ‘eheheh’ the chosen word would finally shoot out of his mouth with a great commotion. He would then repeat that word three or four times so fast it was almost unrecognizable. As I was never in any rush to leave my sea viewing seat, I could eventually make sense as the words came out in uneven jolts and could string them together in a sentence. As we chatted he would pluck at his trouser knees with huge hands, red with cracks across the knuckles. ‘Are they sore?’. I asked him once. ‘Aye aye aye’ he said but at the same time shaking his head. I brought him down a large jar of aqueous cream anyway. Weeks later when I was in having a cup of tea I noticed the jar on the shelf over the fire, unopened and covered in turf dust. The neighbors said he was very intelligent with great knowledge but just couldn’t get the words out. I felt sad for him. He was born at the wrong time. If it had been ‘now’ his speech impediment would have been picked up early and he would have attended a speech and language therapist and being able to converse normally. All he got in his day I would guess was a clip in the lug. I grew very fond of the two brothers and took to cycling down to them one day a week. A Tuesday if I remember rightly. I would bring a loaf of my home baked bread though I needn’t have bothered. Martin was a dab hand at baking curranty soda bread (I suspected he soaked the fruit in poteen). They always had the slices laid out thickly buttered on a white plate when I arrived. If the day was sunny we would bring out our chairs and sit looking across the bay at the mountains. If it was raining we would sit at the fire where the smoke would sting my eyes. I loved hearing Martins stories especially ones about being ‘led astray’ by the fairies. One day however cycling down to the house, I was met by Tom running up the road. He was in a distressed state and I didn’t wait to try and understand him. I flew on down the road and when I turned the corner, I was not surprised to see Martin, lying on the ground, his bicycle on top of him and beauty whining and trying to lick his face. He was in a poor state but conscious and with no apparent broken bones, though the gash on his forehead looked serious enough. Tom had caught up with me at this stage and together we lifted the heavy bike off Martin and helped him to his feet and over to a chair. ‘Feckin hen ran out in front of me’ He muttered. ‘Of course your brakes worked’ I said sarcastically. He had the sense to look shamefaced! Between the jigs and the reels I rang for an ambulance. ‘You’ll need a few stitches and a tetanus shot’ I warned him. Martin was taken into the local hospital for suturing and observation and skull xray. He ended up staying three nights and I went to visit him on his second day. He was sitting up in bed grinning from ear to ear. ‘Did ye know that talk has got out that I was killed’ He said with a twinkle in his eye. With that he sat back against the pillows folding his arms across his chest in satisfaction. And that is how, for a few days, Martin was famous. I will tell you about the second famous man I met another time. Suffice to say that, though more famous, there isn’t half the story to him! And if you come back and read my next blog I will tell you the story of that meeting. Meanwhile Martin wherever you are (I imagine It’s ‘Tír na nÓg’ with plenty of bicycles) you will always be famous in my eyes. Michel de Montaigne observed life, and he observed himself observing life. And went on to write a large book of essays on his observations and thoughts. One thing struck me as I read these essays; He never mentioned regret and he was right not to. Regret is such a waste! Niente, nichego, nista, niets, nada, diddly squat! Not my career choice, my marriage, motherhood, divorce, walking away from my home, moving back to dublin, bad relationship choices, jobs. I do not even regret my cancer. My cancer was ‘me’, my cells, my illness, my story. I refused to ‘battle’ against it as I would have been battling myself. Instead I tried to understand it, to gentle it, to calm it. And I would almost be so bold as to say I am grateful for it. It was a change of direction. In a life that was so busy I hardly knew what day it was and was often rushing so much that I just touched the ground in spots, it steadied me. But more importantly it gave me a different outlook. I slowed down so that instead of a blur I began to see life with clearer eyes. Everything appeared brighter and more meaningful. Everyone I met had a place in this new journey. I became aware of the impermanence of relationships. I could see now that everyone I met wasn’t necessarily meant to stay. That I should willingly let go of people as they slipped in and out of my life. Some did stay for longer periods. Others only fleetingly. But everyone of them, by word or deed (or even both) added something of significance. It was up to me to recognise that significance. And so my journey of awareness started. On the day I had my initial biopsy, I was limping home pushing my bike. The radiologist who had carried out the ultrasound guided procedure had warned me not to cycle and even if I had chosen to disobey him, the bulky pressure dressing would have made it too uncomfortable. I stopped at a shop, a small bakery (that I was even thinking of food at a time like this I should have seen as a good sign but I hadn’t begun to think that way yet, so new was I to it all) and leaned my yellow bike against the wall and went into the warm sweet smelling interior in a daze. Two rosy cheeked women with flowery aprons lifted their heads to look at me. They looked like sisters with the same very short curly grey hair. One slightly taller than the other. ‘What a beautiful bike’ The taller one said. ‘Aragh cancer shmancer’! She laughed dismissively handing me a serviette ‘Been there! done that and sort of worn the T shirt. She ran her hand ruefully through her tight wavy hair. ‘And Mary too!’. She smiled warmly over at her colleague who nodded in agreement. ‘Yes Its a bit of a journey all right but you’ll meet wonderful people along the path!’ She continued breezily. ‘Now! What would you like? We have some lovely fresh scones. They’ll do you the world of good with a nice cup of tea’. The shorter plumper woman nodded again. ‘Nope we won’t take a penny for them’ She agreed. ‘Oh the trick is, leave the worrying to the doctor. Thats what he’s paid for! Just do exactly what he tells you! That way you won’t be able to blame yourself if it all goes pear shaped. Mary laughed ‘She’s right you know’. Then she added more seriously ‘And watch out for yourself on that bike with those buses and taxi’s! They are more likely to kill you than any tumor’! I left the shop with a heavy bag of scones and a lighter heart. Now this is not a Montagne essay and I do not want to bog you down with the story of my illness or make a heavy hand of my treatment details. Instead I want to tell you another story somewhat related. Strange though it may seem, some meetings had significance long before I was aware they had. Once upon a time. The beginning of March 2009 to be exact, I walked out of the main hospital doors to the carpark. We had had a busy day on the floor and I was tired and grumpy. ‘Damn’ I thought ‘a parking ticket! I must have forgotten to leave my staff pass visible on the dashboard. But it wasn’t a ticket. Instead it was a letter, folded neatly and held in place by the windscreen wiper. Now my camper (yes! the turquoise one with the pink cherry blossoms painted on it giving the impression that I had driven through an cherry blossom orchard) draws a lot of attention. Sometimes I would find scraps of paper with phone numbers and a ‘do you want to sell your camper’ msg scribbled on them. But this was a large sheet of paper, rather official looking. I presume you are a woman as I have been guilty of peeping through the window of your van and have noted how pretty not only the exterior of it is but the interior too. I love the embroidery anglaise curtains! the silk pink cushions! the beautiful blue linen fabric of the seats. I am presently having treatment for cancer and I often see your van when I attend for my radiotherapy. It lifts my spirits especially on days when I am struggling. One day, when I recover!! I am going to get a van like yours and head off exploring europe and maybe beyond. Thank you for this visual gift. Sorry for rambling on but just want you to know how much it has helped me. There was a name and a phone number. As I stood there reading the letter over again I was struck with how lucky I was to be so healthy. Six weeks later I was diagnosed with metastatic malignant melanoma. I do regret one thing. I would love to know if she(like me) had recovered. I wondered if she had found a camper like mine and explored europe. So in 2010 when I finished my treatment and took off on the yellow bicycle across france I kept a sharp eye out for a camper with an irish reg driven by a woman with a zest for life look in her eye…. Vergings of a half hearted procrastinator. THE PATH TO THE RIGHT WILL BRING ME TO THE SEA. Procrastination; To postpone until tomorrow. To defer until a later date. I should have paid more attention to english vocabulary when I was at school. Since I started writing this blog I am coming across many interesting words that I am familiar with but not quite sure or can’t remember the meaning of. Not a thing I am proud to admit to. I am proof of the idea that school at a young age is a bit of a waste, that we should be off adventuring and exploring when young and have the physical energy for it and do our learning later when our bodies have calmed down. An Opsimath I suppose one could refer to me as (but that is subject matter for another essay). One of the words I came across recently and had to look up to remind myself of its correct meaning was ‘procrastination’. ‘You don’t know the meaning of that!’ I hear you cry in disbelief. Well I do have a vague idea, but maybe the fact that I am one is reason for my lack of interest in such a word. Yes I am a procrastinator! As I say these words out loud I feel a weight falling from my shoulders as when given a diagnosis. A sort of So thats what I have/am feeling of resignation (and now that I have admitted to it, I can deal with it). The problem of course is once you have a label you may find that even if you do manage to change, it can be hard to un-label yourself. Or worse, you may be in danger of settling happily into your label. Or that if you can’t teach an old dog new tricks (as the saying goes) How do you expect to teach a chronic procrastinator, who didn’t (until just recently) even realise she was one, new ways? I thought I was just laid back/easygoing/verging on lazy. Is it possible to be a particular procrastinator, procrastinating only about certain things. Paying bills for example. On a scale of one to ten which way do I lean? I will go away now and ponder this and defer my judgement until later. When I come back to my laptop I have decided not to procrastinate any longer but to settle down and get on with the writing of this piece. 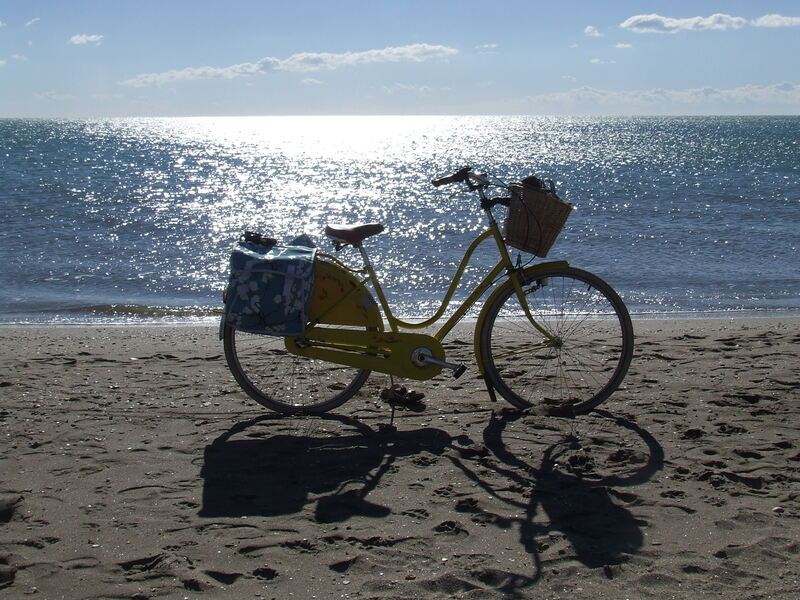 Its such a beautiful day and what I would really like to do is head off somewhere on my bicycle. I debate about this for about ten minutes until the bicycle wins. Now procrastinators should never live in apartments. It is much too difficult to get easily to the outside. And mine being on the third floor is enough to turn a motivated person into a procrastinator. But I make a start by taking my bike out through the living room door. Having got that far I decide to keep going and go through my main door. Then along a corridor and into a lift, where, lifting my bike up on its back wheel and letting its front wheel climb the lift wall, I can just about manage to fit us both in. On arriving at the ground floor I untangle myself from where I have got my head caught between the handlebars and saddle and I wheel my bicycle down the reception area. This is a very pleasant space with some large potted plants that have a notice stuck to each pot ‘Please do not water me‘! Procrastinators rarely get around to watering their own plants let alone anyone else’s . Though we do think about it. No! the potted plants need not fear me drowning them! Which brings to mind other people worse than us procrastors. People who are always on the ball, jumping at opportunities, whizzing round, motivated, interfering, controlling, not trusting others to take care of things. Over watering house plants!! pfffft I am glad I am not like THAT. I go through another door and one final one and at last I am outside. By this time I am exhausted and I sit down on the bench outside the door. 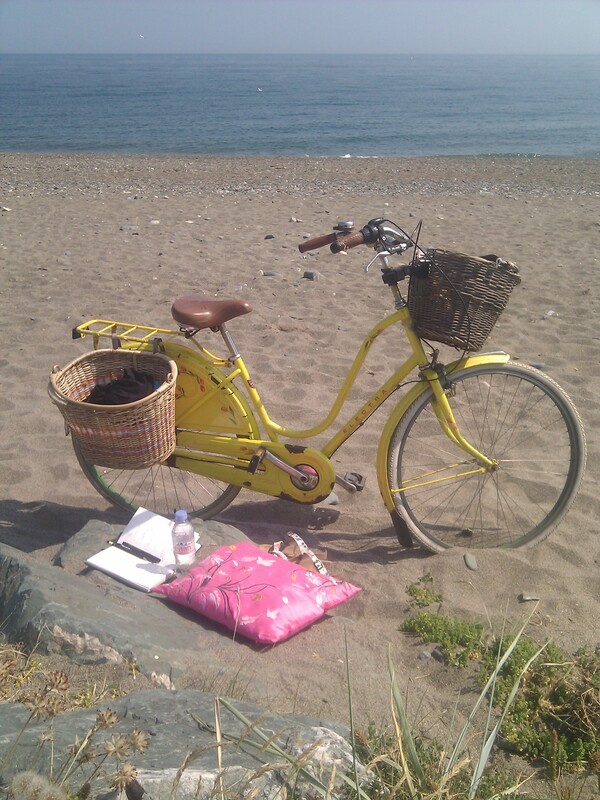 Maybe I should call off my cycle and go back and have a cup of tea and finish writing my piece. But the thought of the of getting back into my appartment with my bicycle is not really appealing either. I sit and consider my options for five minutes. To the right the going is flat and will take me to the sea (should I go back and get my swimming suit). To the left it is uphill and takes me to the mountains (should I go back and get some water in case I get thirsty). Sitting on the warm bench I turn my face to the sun and mull it over. I’ll go to the right I decide! Its not turning into a gardening blog. Well maybe a bit of one. You see I love gardening nearly as much as bicycling. And like bicycling I learn a lot from gardening. In fact the two seem intertwined in their nature. 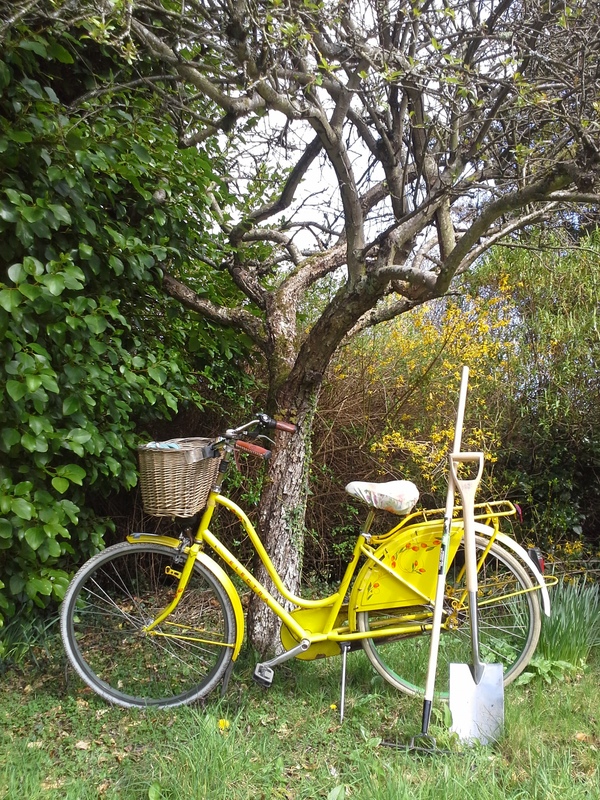 Gardening takes observation and time and cycling does too. (Well my type of cycling that is). These days I notice a change. Not only in the longering of the evenings, the earlier light in the mornings, the green greenest of the foliage, the clarity of the air, the blueness of the sky after the sudden refreshing april showers, but in myself. Is it an age thing this turning inwards? My thought’s deepening as I wonder more about the meaning of my life. I am becoming less aware of the outer me. Clothes, makeup, perfume and ornamentation are no longer so important. And more aware of the inner! I note more intensely the small less gaudy but equally things of wonder, surrounding me. That patch of tiny violets as the sun strikes them through the dappled light of the tree’s. The dazzling yellowness of the dandelions growing in the ditch, more beautiful and intricate on close inspection than any carnation. The carpet of blue speedwell on the bank beneath the slow-to-leaf beech tree. The dark rich browness of the sod as I turn it over. The satisfaction of the clean bite of the spade into the soil. The pinkness of the worms coming to the surface as the earth slowly warms. The robin waiting her turn as I step away and reach for the fork. Maybe yes from a visual perspective. When I stop at the local shop on my way home for the makings of supper, I am aware that my hair is wild and probably host to a few twigs. That there is often mud on the knees of my trousers. My hands are a bit grimey. But I am also aware of the happy spring in my step, the rosy flush to my cheeks, the shine in my eyes. ‘You’re looking well’ The man at the fish stall remarks when I hold out my still muddy hand (I swear I washed them)for my piece of salmon. I suppose a man who constantly has his hands in the innards of fish is drawn to a woman wearing half a garden on her head. So I thank him for his compliment and in return remark how well he has filleted my salmon for me. And now I am on a weeks holidays. But instead of a spa, I cycle up to my daughters garden where I have lots of company in the form of an amazing amount of Bird’s. And a small dog of unusual breed. Her name is ‘Blaithin’ ( pronounce Blawheen) Irish for ‘little flower’. A Petite Basset griffon Vendeen of a better personality than any human. She accompanies me throughout my gardening day, giving her opinion on everything. Not following but trotting on ahead, her head up and long tail wagging as she views her domaine (After all it is her garden more than mine). She never argues with me. Likes what I say and also likes when I say nothing at all (and keep saying it )and is quite content to sit and observe me dig. I am teaching her what not to step on or dig up (she’s very fond of digging) my freshly dug soil. She’s a clever little dog and catches my drift quickly. And most importantly she also doesn’t tell tales on me. Hanna and Rui Have purchased four state of the art raised beds, To contain their vegetable patch but I believe to contain me as well. Arriving flat packed Rui has assembled them and when I lean my bicycle against the apple tree and take the tools from the garage, I see them lying on the grass. There is a note on the kitchen table. Rui has assembled the beds. Just mark where you want them and He will put them in place when we get home. THEY ARE VERY HEAVY SO DONT TRY TO MOVE THEM YOURSELF,!! I throw the note in the bin and move them into place. In a neat row along the fence where they will get full sun. Old grass cuttings first, some compost I have been making at home, manure and finally topsoil. A quick rake and we are ready to go. I transplant the broad beans that I have grown in pots. I sow pak choi, perpetual spinach, lettuce, carrots, peas, garlic (I know its a bit late) onion sets. Too early for runner beans and climbing french beans yet. I cover all the beds with garden fleece (My favorite stuff! I have kept many a carrot fly at bay with it) which I will remove as the weather warms up. But I will not be contained. To the left I open up an area for currant bushes (red and black) and gooseberry bushes and below to the right of the beds I start another for raspberries. My plan is to keep expanding until they put their feet down. Hanna and Rui that is, not the raspberries. I liken myself to an invasive species, mint maybe, creeping slowly across the garden. On the morning they look out their bedroom window and find runner beans growing across it and up the drain pipe I will know I have crept too far.